If you're a pirate, you plunder. It's just your thing. And once you've got that treasure, you need to hide it. So you find a nice, remote island, and you bury it. Thing is, other pirates are also on the lookout for treasure and are more-than-happy to dig up your hoard and carry it back to their ship. Plus, deserted tropical islands tend to be filled with things like nasty crocodiles that you've got to watch out for. 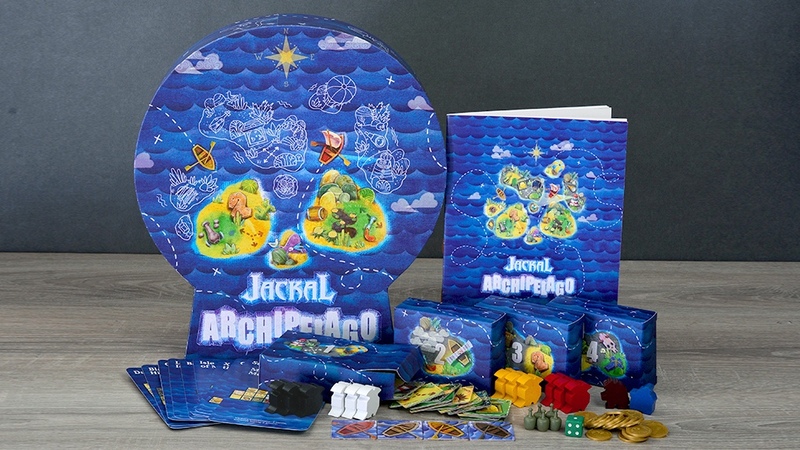 All that is what's going on in Jackal Archipelago, a new board game that's up on Kickstarter now. Pirates disembark on Treasure Island and try to find as much gold as possible. Each player controls 3 sailors, who can move around the island, carry found treasures, fight enemies, and find adventures. If you're someone who likes digging for buried treasure, fighting pirates, meeting crocodiles, looking down the barrel of a cannon, and dragging gold back to your ship, then shiver me timbers, this just might be the board game for you! The Kickstarter campaign's up and running now. They're about 1/4 of the way to their goal with still 29 days to go.